We are having a cold, gusty, rainy Nor'Easter today, but the hummingbirds seem to be handling it just fine. 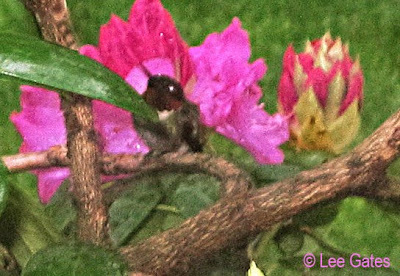 Lee writes,"I was watching the wind blow EVERYTHING around this morning when I noticed a wee thing fly into my Rhododendron bushes. Yes, it was a hummer escaping from the weather! I grabbed my camera, took the screen out and captured him here."